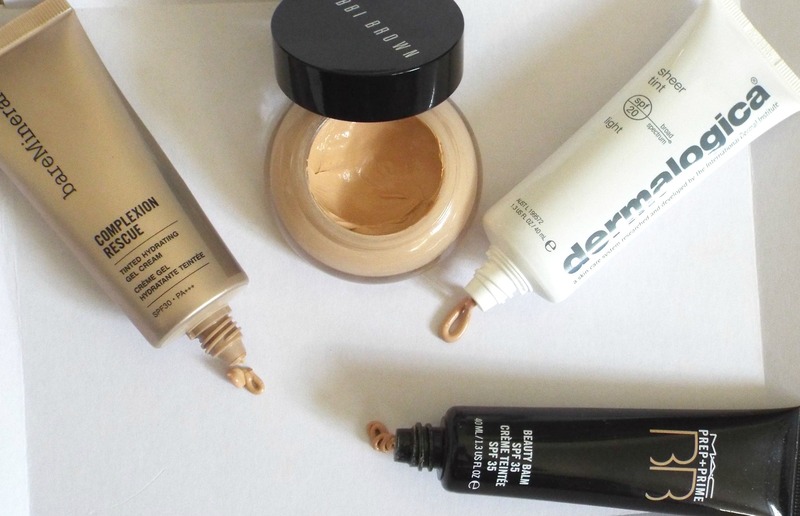 As much as I am both thrilled and intrigued by the plethora of foundations on the market, the truth is I don't really wear foundation that often. I generally like my skin to look natural (except red lips, obviously) and glowing, so most of the time when I go out in public I reach for a base that offers some coverage, but isn't quite a foundation. 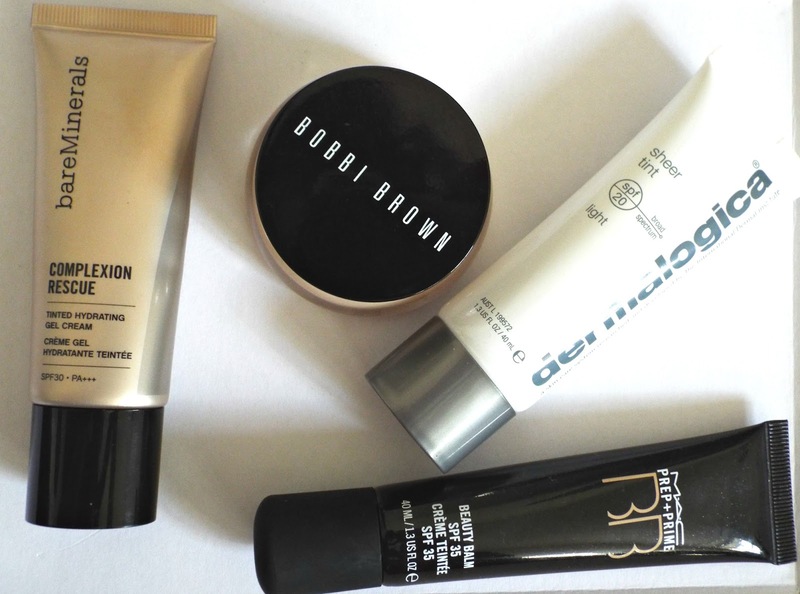 BB Creams, Tinted Moisturisers and pigment-blurring potions are my friends and I use them all year round. They are just nice, low maintenance alternatives to full-blown foundations and every single one that I'm about to talk about blends away easily using just fingertips, so they're handbag-perfect and especially handy when you're in a rush. I love pretty much everything about Complexion Rescue. From the mousse like texture through to the cooling effect on the skin, this is one seriously good skincare/makeup hybrid. The coverage of Complexion Rescue is definitely sheer- it just adds a bit of a tint to the skin and evens out skin tone for a nice natural finish. I wear shade Buttercream which is slightly yellow toned and gives my face a lovely glow throughout all four seasons- I just add a bit of bronzer in summer and it does the trick nicely. SPF 30. I bought the Prep + Prime Beauty balm after using the Prep + Prime BB compact and, whilst being impressed overall, felt the need for a little more hydration. Designed to be used as a primer or on its own, Prep + Prime creates a nice, even base that covers blemishes, pigmentation and dark circles without making you look too 'made up'. The coverage is heavier than Complexion Rescue and can leave me looking a tiny bit ghostly so I rarely use it completely on its own- for me, a pop of blush or bronzer is best. It's a thick, creamy texture that blends seamlessly and is a perfect foundation replacement on days when you don't feel like wearing a full face or simply can't be arsed. SPF 35. This citrus-scented pot of tinted hydration is my absolute favourite when the weather is really, really cold. I think I initially became interested in it because I'm irrationally drawn to any beauty product with the word 'balm' in the title. It's ridiculous, I know. The Tinted Moisturising Balm is one of my 'precious' products, which is probably due to the £35.50 price tag as well as the fact that it just feels so darn luxurious. Ultra rich, the emollient formula of the tinted moisturiser makes it very good for dry skins and not so great for oily complexions, which is why I only really use it when it's cold. In terms of coverage, this is in a similar league to complexion rescue- it just enhances and evens out the complexion rather than masks anything. If you live in a super freezing climate, have dry skin, or spend a lot of time in the alps, you need this in your makeup bag, stat. SPF 25. What's your go-to non-foundation base? Let me know! I loveeee BM Complexion Rescue!